Cascadia is a bioregion roughly encompassing Oregon, Washington, British Columbia and parts of other states and provinces in the U.S. and Canada’s Pacific Northwest (see VT #36). 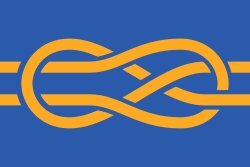 In 2012, nearly 17 years after designing the popular Cascadian flag, I created a nautical flag for Cascadia, specifically for vessels of oceans, rivers, and the sky. 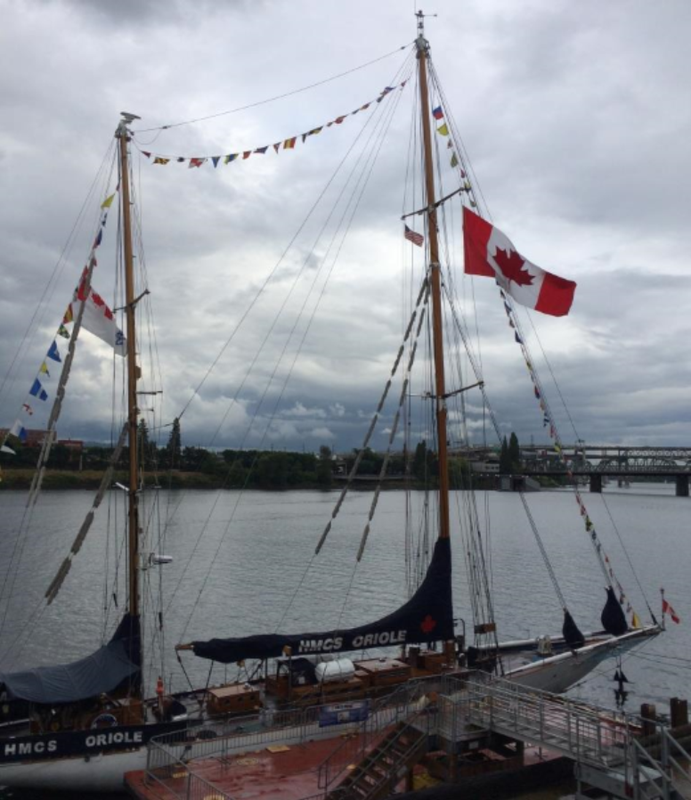 The “Cascadian Wave Flag” is a tribute to the bioregion’s waters and sky. 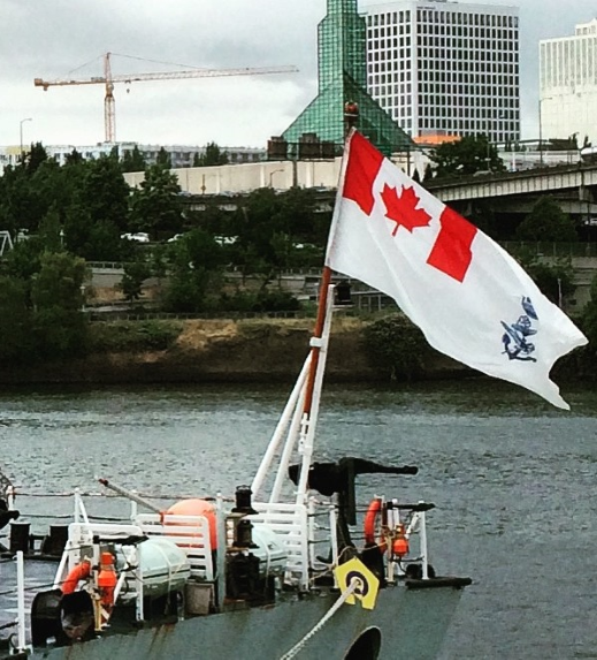 The Cascadian Nautical Flag: A tribute to the waters and sky of the bioregion. Designer: Alexander Baretich. At the top of the flag, the two blue and three white waves represent the mountains and partially clear sky. Hence the white waves next to those two top blue waves represent snowpack and clouds. Two green waves are the forest-covered hills. Between the two green waves is a single white wave that represents mist or low clouds. At the bottom of the flag, the two blue waves represent the Pacific Ocean and the Salish Sea as well as the region’s rivers (Columbia, Willamette, Frazer, Snake, etc.). The white waves next to the two lower blue waves represent sea foam and the crest of waves. The green isosceles triangle with its base against the hoist represents the forest-clad hills and mountains. The Douglas Fir echoes the central symbol of the 1995 Cascadia flag. Several other flags in the Pacific Northwest have blue and white waves, including British Columbia, the Zapatopi Cascadian flag, and the city of Vancouver, B.C.—they may have played an unconscious element of my creation of Cascadian Nautical flag. It is certainly part of our collective iconography to represent bodies of water with blue and white waves. I intentionally made the flag extra long (longer than 1:2), although I have made versions in standard proportions. A longer flag may well serve a vessel better than a shorter one. Three colleagues and I have just launched the Cascadian Flag Making Cooperative. 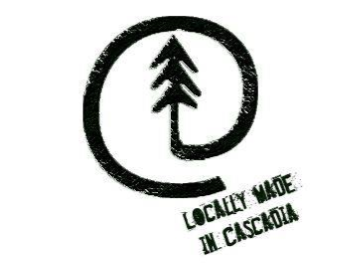 Our general goal is to provide Cascadian flags, locally produced and “artist-certified” with our logo, the @Doug symbol. The “@ Doug” logo of the Cascadian Flag Making Cooperative. We hope to sell or offer this flag only to owners or captains of vessels—ideally merchant vessels that conduct fair trade as opposed to “free trade” or vessels that have a mission of exploration, research, ecology, bioregional awareness, and/or for socioeconomic and ecological justice. Like the classic Cascadian flag, also known as the “Doug Flag”, I hope this flag—as well as all my designs—will not be used for hate, exploitation, and against the values or principles of bioregionalism. In seeking out a bioregional flag, I believe that it’s the bioregion that will capture the artist—not the artist capturing the bioregion. The Registry is online at oregonflagregistry.org. Contact Scott Mainwaring to join the team: info [at] portlandflag.org. Adopted January, 2003, the flag places a stylized Chinook salmon in the style of Northwest Coast Indian art in black and red on a field of white. Centered on its stomach are the contours of a human face. 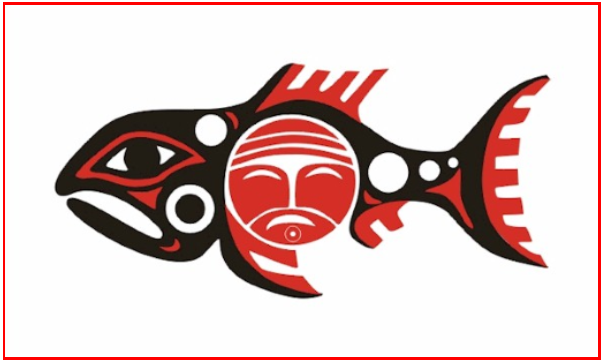 The flag’s salmon image is the tribe’s logo, designed by Tony Johnson. An accomplished artist and canoe carver, he also led the Cultural Affairs Committee which adopted the flag. If Canada, the United States, and Mexico were to join to form a North American Union, what would the resulting flag look like? Michael Orelove combines three national flags into one. Mike Hale, the former owner of Elmer’s Flag and Banner, put this flag together for me. 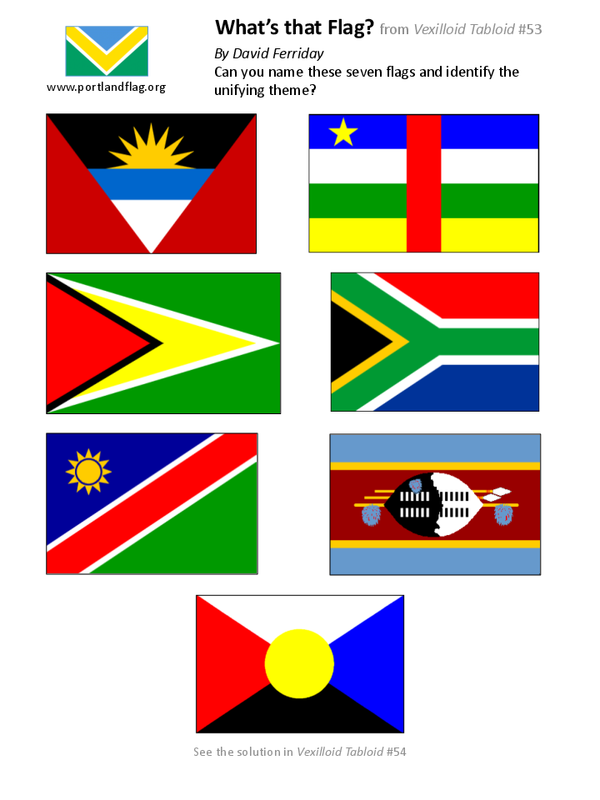 Residents of each country can easily recognize the color and design elements of their national flag in it. Author SDMPosted on August 12, 2015 August 13, 2015 Categories PostsTags National Flags, US Flag, VexTab53Leave a comment on North American Flag? What’s in the Flower Bed This Year? Every year, Michael Orelove plants his “flower bed” to represent a flag. 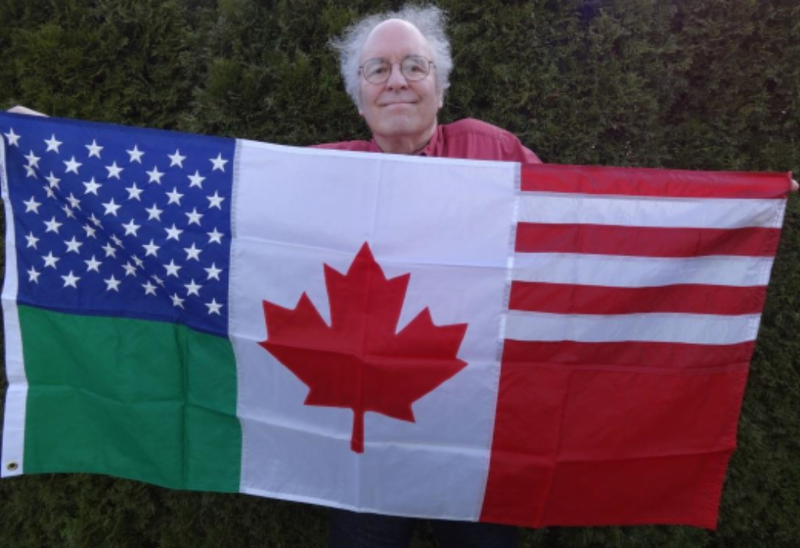 Since 2010 he has grown the U.S., Oregon, U.K., Canada, and Alaska flags. This year he honors his native city, Chicago. 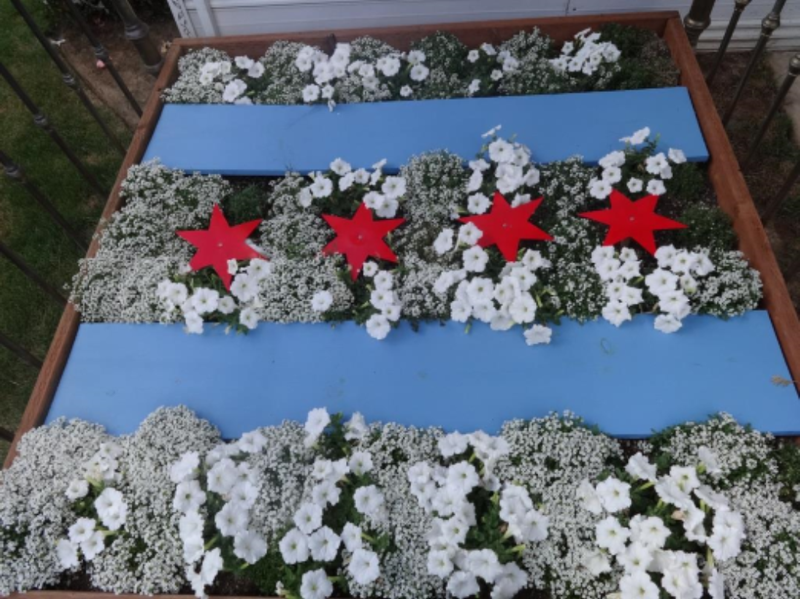 Michael Orelove’s “flower bed” features the flag of Chicago, Illinois. The flag has a white field with two horizontal light-blue stripes and four red stars arranged horizontally in the center. The blue stripes symbolize Lake Michigan and the Chicago River. The stars represent Fort Dearborn, the Great Chicago Fire of 1871, the World’s Columbian Exposition of 1893, and the Century of Progress Exposition of 1933. The stars are six-pointed (sharper points than the six-pointed Star of David on Israel’s flag). The number of stars has increased from two over the years. The white flowers are alyssum and petunias. Author SDMPosted on August 11, 2015 August 11, 2015 Categories PostsTags City Flags, VexTab532 Comments on What’s in the Flower Bed This Year? On 13 July the New Horizons probe sent an image of Pluto dominated by Tombaugh Regio, a large feature informally called “the heart”. 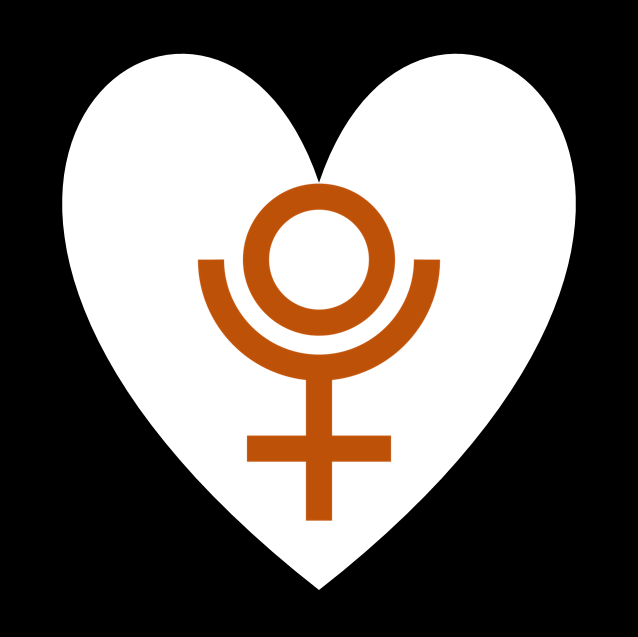 Inspired, I created a flag for Pluto: its astrological symbol in orange-brown (its overall color), in a white heart, on black (for space). 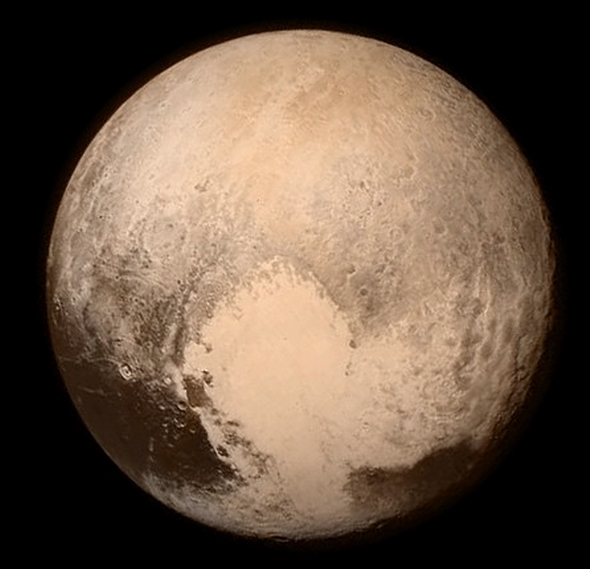 A Heart Flag for Pluto, designed by Scott Mainwaring, 14 July 2015. I chose the astrological over the astronomical symbol (♇) as its symmetry makes it more flag-friendly. The aspect ratio of 1:1 is the closest a rectangle can come to the circular shape of the (dwarf) planet; and distinguishes it from standard terrestrial flags. Stickers, hats, and other products with this design are for sale on Zazzle.com. In our July meeting, hosted by Ted Kaye, 16 PFA members enjoyed a lively 3+-hour evening of flags and other wide-ranging topics. As the host, Ted led the introductions and moderated the discussion. John Schilke exulted in seeing a photo of a Roerich flag displayed on SE Stephens St.) and gave a brief description of its creator and its purpose—to protect cultural sites in wartime—(see VT #20). 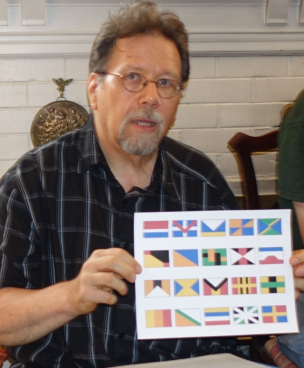 Michael Orelove gave updates on his flags-for-educational-purposes solicitations, showed off some flags and burgees, and passed around the results of his writing off for state seals—40 of 50 states have responded so far. David Koski described his project to facilitate flag image construction using Adobe InDesign, with layers for standard flag components—he showed resulting example flags. David Koski shows some results from his flag image generator. Ted Kaye led a discussion of the Confederate Battle Flag controversy, using actual flags to illustrate the history of the CSA’s flag use. He has been very actively giving interviews in the past two weeks at the local and national levels on that and other subjects (see The Confederate Flag Flap). Ted Kaye provides a summary of the flags of the Confederacy, displaying the first national flag, the “Stars and Bars” as John Schilke and Fred Paltridge look on. Lorraine Bushek, joining us for the first time, described her work as an artist, including the 3rd-place finalist in the 2009 Oregon flag redesign effort. 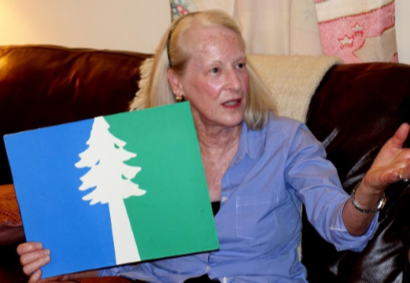 Lorraine Bushek describes her finalist entry for the Oregon flag redesign. Ken Dale reflected on the symbolism of the U.S. Capitol building—whose construction continued even during the Civil War. Scott Mainwaring noted that cellphone cases featuring the Portland flag orient upside-down when the phone is held vertically. He created a corrected version on Zazzle.com. He has also been experimenting with giving digitally generated US flags a “hand-made” feel, with “randomly-perturbed” stars and colors. 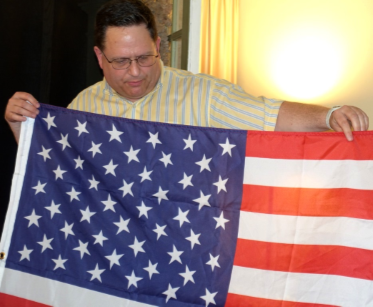 Scott Mainwaring and his U.S. flag with “randomly perturbed” stars. Max Liberman consulted with the assembled members on agenda items for the 24th general assembly of FIAV in Sydney in September; he and Ted were named delegate and alternate. He then shared some of the thousands of submissions for a new flag for New Zealand—the good and the bad. Some of the stranger New Zealand entries amuse Max Liberman. Nathaniel Mainwaring, who enters 4th grade this fall, updated us on his Minecraft-based flag work, featuring zombie pig-men. 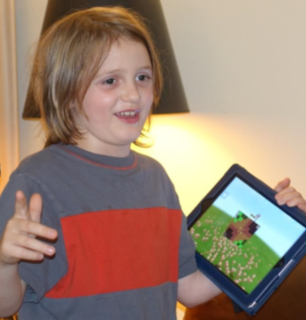 Nathaniel Mainwaring shares his Minecraft-based flag. Casey Sims described the development of his personal flag, and closed his presentation with a song on his guitar. Casey Sims sings a song inspired by his new personal flag, enjoyed by Robert Izatt, Ken Dale, and Dennis Stephens. Patrick Genna displayed a recent Goodwill acquisition—a large flag of Antigua & Barbuda and distributed a fact sheet about it. 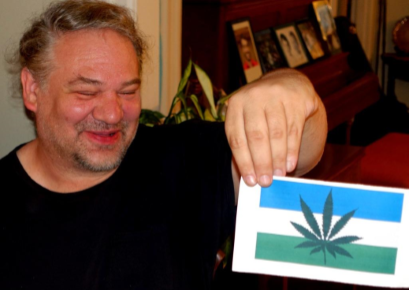 Robert Izatt described the crowdfunding campaign for the Cascadian Flag-Making Cooperative. 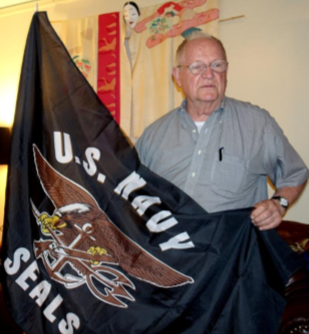 David Ferriday fooled everyone when unfurling a black military flag. 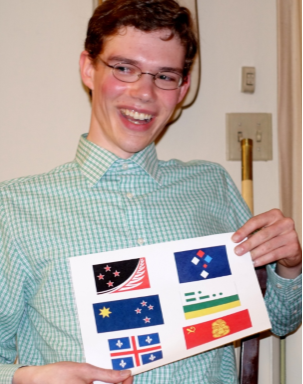 Alexander Baretich shared some of his recent designs, including the Cascadia nautical flag (see article, p. 6), religious flags, and another bio-regional flag—that of Danubia. Alexander Baretich debuts a topical variant of his Cascadia flag. Dennis Stephens lauded the recent Roman Mars TED Talk on city flag design: “Why city flags may be the worst-designed think you’ve never noticed” (ted.com), and showed the flag stickers on his laptop documenting his travels. The meeting started at 7:00 and adjourned at 10:20, reflecting the host’s poor timekeeping ability. Our next meeting will be at the home of Larry Snyder on Sept. 10th. 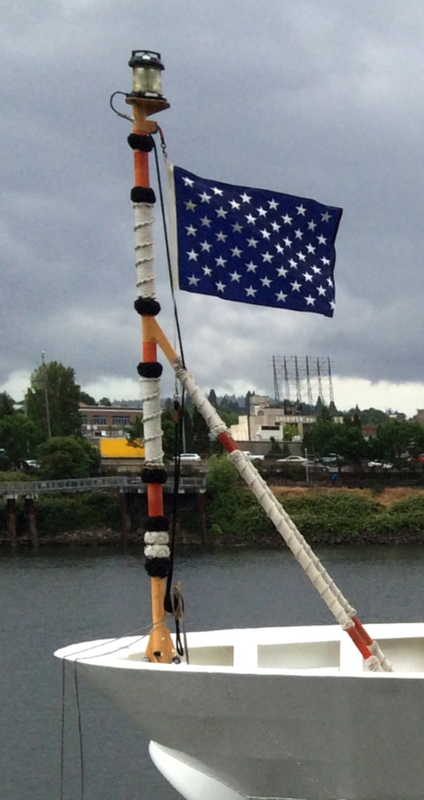 Patrick took the Portland Flag Association flag for him—the customary task of the next host. 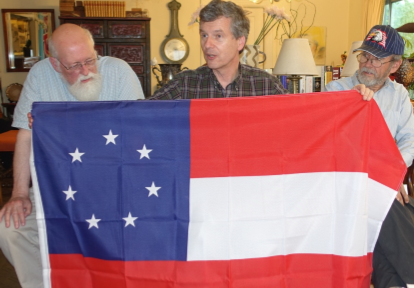 At the July 2015 PFA meeting, Ted Kaye provides a summary of the flags of the Confederacy, displaying the first national flag, the “Stars and Bars” as John Schilke and Fred Paltridge look on. In June, the flag world witnessed a huge shift in attitudes toward the Confederate Battle Flag. Following the race-based shootings in Charleston, South Carolina, public opinion moved swiftly toward removing the flag from public displays and from merchant shelves. “Few emblems in American history have provoked stronger passions than the battle flag of the vanquished Confederacy. To some it symbolizes honor and independence; to others, hatred and slavery”, says Tony Horwitz, in Confederates in the Attic (1998). Usually only an occasional interview guest discussing flag topics in local and national media, for two weeks I found myself speaking daily—to Slate, NPR, National Geographic, CNN, PBS, Georgia Public Radio, KXL Radio (in Portland)—providing history, background, and perspective on the controversy. Ironically, the work for which I may be best known, the flag-design guidebook Good Flag, Bad Flag, quotes the National Flag Committee of the Confederate States of America in describing what makes a successful flag design. Top-name retailers, flag manufacturers, and flag dealers tripped over themselves to stop selling or making the flags—although Huntsville’s Alabama Flag & Banner ramped up production and sales! Here in Portland, The Oregonian described how Dave Anchel, PFA member and owner of Elmer’s Flag & Banner, consulted his staff and his conscience, and decided to remove the flag from display, only offering it for sale from behind the counter. Regardless, his entire stock sold out the next day. In likely the most newsworthy aspect of the controversy, the battle flag came down from the Confederate Soldiers monument on the South Carolina statehouse grounds. Prediction: Mississippi’s state flag will be the next target for change. For more information, consult The Confederate Battle Flag, America’s Most Embattled Emblem by John M. Coski (2005). It provides a strong history of the flag and its evolving use from 1861 to the present. Political cartoon by Enrico Bertuccioli, cartoonmovement.com, 22 June 2015. 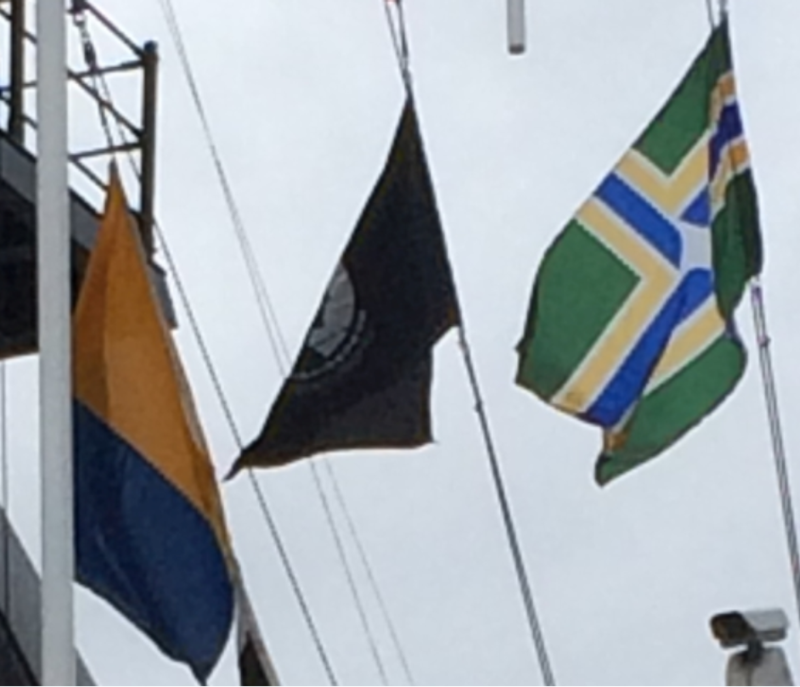 And, as always: notes from our last meeting, flags in the news, the Portland flag miscellany, the What’s that Flag? quiz, and more!